Who could imagine a life without a cell phone. To many people it’s as necessary as a thumb, and one could not imagine what life would be without one. The advent of smartphones has made the device even more invaluable, and you’d see many people with their phone in hand whenever they have extra time. Printing machines are red at AEON. I got my first phone about 15 years ago, and it could only do calling. That phone was called PHS (personal hand phone system), and it didn’t have a camera. Now I have a phone that can do everything in addition to phone calls, including texting, taking photos and videos, searching the internet, playing games, and then some. Especially, the quality of the phone camera has developed. It now has a very high quality, and there are even applications that can be used to edit and enhance the pictures. In 2000, J-Phone (Soft Bank) and Sharp started selling phones with cameras in Japan. Emails with pictures attached came shortly after that and other companies also incorporated cameras in their phones. By 2003, there wasn’t any phone without a camera on the market. People seem to never getting tired of uploading pictures on their facebook pages and other social networks. And now we have selfie sticks that are used to take pictures of ourselves and sometimes many people together. Especially, girls love to take pictures and share them on the facebook, Instagram, snapchat, and any social network. 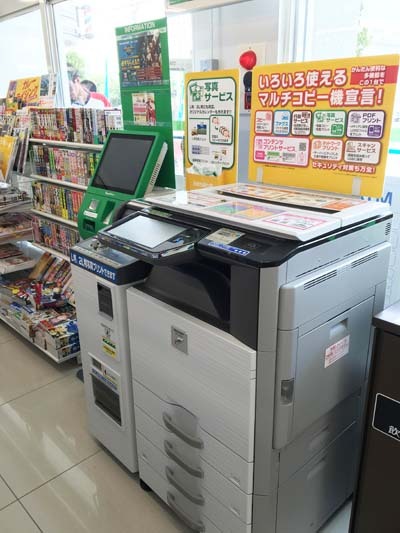 FamilyMart copy and print station. I like doing that too, however, I prefer to print them out. Prints of personal photos make a great gift, such as a photo albums or a picture on a birthday/anniversary/Father’s Day/ Mother’s Day card and more. Sometimes one also needs an ID photo immediately. If you just want to keep your pictures in your phone, that’s OK. But in a few easy steps you can just choose and print out the pictures you want. 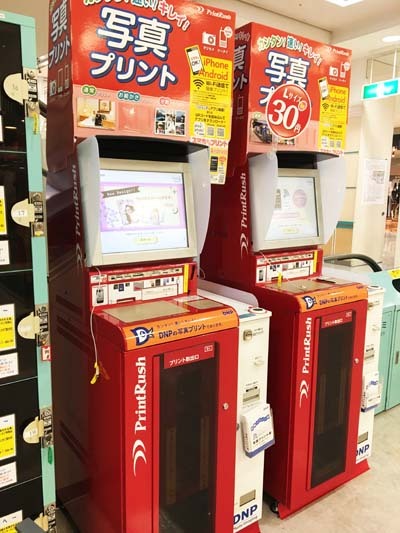 FamilyMart convenience stores and AEON department stores including the Rycom Mall have machines that allow you to print out pictures from your phone. Instructions on the machines are in English making it easy for non-Japanese speakers just follow the directions. Copy machines at FamilyMart stores and red machines at AEON accept micro SDs, mini SDs, SDs, memory sticks, memory PRO sticks, memory stick duos, memory pro duos, Compact Flash’s, CDs and DVDs, or you can use the wi-fi in the store to download an app called Print Smash at FamilyMart or Play Photo at AEON. Both cost ¥30 per picture and up, yen only. You may have taken many pictures since you coming to Okinawa. Maybe it’s a time to print them out.